I was intrigued by the idea of this version of Frankenstein 2015, as it is told from the perspective of the normally disregarded ‘Igor’, however, with the savaging it received from mainstream critics, I was quite apprehensive about actually watching it. Harry Potter, sorry, I mean Daniel Radcliffe plays the hunchback circus freak who is to become Igor. That’s a little unfair really, because although Dan is once again playing a pleasant, long suffering chap, he has definitely left Hogwarts behind. While he struggles on as a circus freak and loves from afar the acrobat Lorelei, he studies anatomy and surgery, tending to the injured performers. 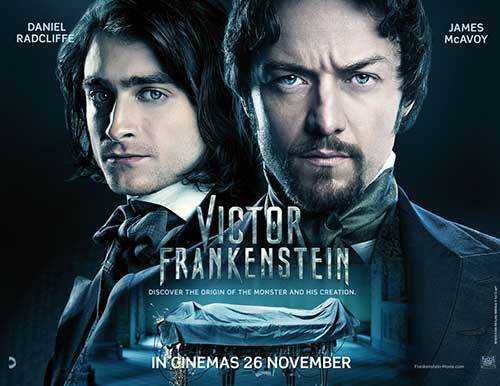 Victor Frankenstein (James McAvoy) is the eccentric student of medicine and anatomy who stumbles across the unfortunate medical genius as he seeks out animal parts for his experiments. The two hotfoot it away from the circus after Victor witnesses the wasted skills of the nameless clown first hand and sets him free. Once at Frankenstein’s residence, Victor reinvents the bewildered escapee and names him Igor, as a homage to his somewhat absent housemate. Together the two aspiring medics cross legal lines and ethical boundaries as they embark on a journey to make life from death, whilst under the constant scrutiny of Detective and religious Zealot, Roderick Turpin, ably played by Sherlock’s Andrew Scott. 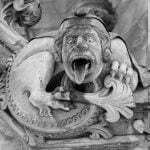 The tale is very much about transition, questioning and moral boundaries, however it does miss the mark by not addressing them deeply enough, or allowing the spiralling insanity of Victor Frankenstein and the religious desperation of Turpin to fully evolve. While Igor maintains his innocence and doesn’t succumb to the darkness Frankenstein has shown him, he is the catalyst for the success of the experiments, which leaves him in a profound ethical quandary that we don’t see manifest clearly enough in his behaviour or speech. As happens all too often, with the exception of the open scenes, the love interest of Igor seems pointless until you realise that she is the anchor holding him in the light. Again the importance of this relationship is not highlighted sufficiently or given enough attention, so it is seemingly frivolous and not relevant to the plot. Frankenstein’s main creation is almost incidental and the storyline is questioning what makes man become a monster, showing us that there is no black and white, only grey and more questions than answers. That part is evident and for me it is what holds the film together. Overall the acting was reasonable and the mood of the film slightly unsettling and uncomfortable. I don’t know whether to put that down to the missing elements and call it negative, or the black humour with successful direction and timing, meaning it was right on target. I’m not very forgiving. The director called the original Frankenstein novel “Dull as dish water” So I’m glad his idiotic movie failed. SIMON BALL says about Gothic: "By thunder this was a hard film to review without giving too much of the plot away!"